being smart with their money. Financial Literacy Curriculum of The Year! Your children are fortunate that you have found this product. A parent is the most influential teacher in a child's life - especially when it comes to money. Children form their attitudes about the importance of savings between the ages of eight and twelve. 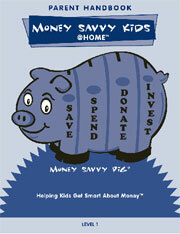 If you want to instill good money habits in your children, and are looking for help, Money Savvy Generation offers parents Money Savvy Kids @Home, a creative, child-friendly educational program that teaches personal finance basics in a fun, approachable way to ensure that the learning sticks. Don't leave your kids to learn about money the hard way! "I just have to let you know that we are really enjoying the MSK@Home program. Our girls look forward to our Sunday night "family class". It's even more fun to hear the vocabulary being used often and in context. This is a fabulous way to open discussions and raise awareness about money and how we use it. Those little "Aha" moments that they experience in our daily lives as consumers are amazing." With gratitude, Molly J. See the product review at Cathy Duffy Reviews. See the product review at Zephyr Hill. Designed for children ages six to eleven, Money Savvy Kids @Home is the perfect starting point to teach a child how to get smart about money. 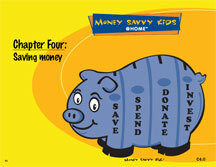 Leading the way is the award-winning, interactive Money Savvy Pig piggy bank which helps parents and children explore such topics as the history of money, where does money come from, the importance of earning money and, of course, the four basic money management choices: Save, Spend, Donate and Invest. The eight chapters on the CD-ROM are designed for a parent and child to read together. 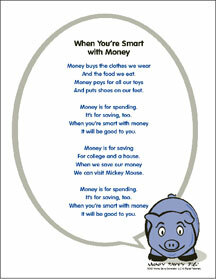 The four children's sing-along songs help to reinforce the money management concepts introduced. Sixteen student workbook activities help your child to practice what has been learned. The comprehensive discussion guide for parents includes commentaries by Susan Beacham, nationally syndicated columnist on the subject of kids and money and founder of Money Savvy Generation . To help deepen parents' understanding of how children should relate to money, Susan talks about goal setting, money choices, teaching kids to pay themselves first, and that favorite topic --- allowance. Working together, parent and child can complete each chapter in about 60 minutes. Tackle one, or more than one at a time. Work at your own pace in the comfort of your own home. 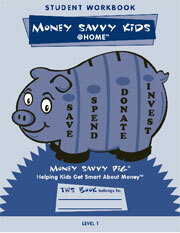 Proven Effective Money Savvy Kids @Home is entertaining and effective. 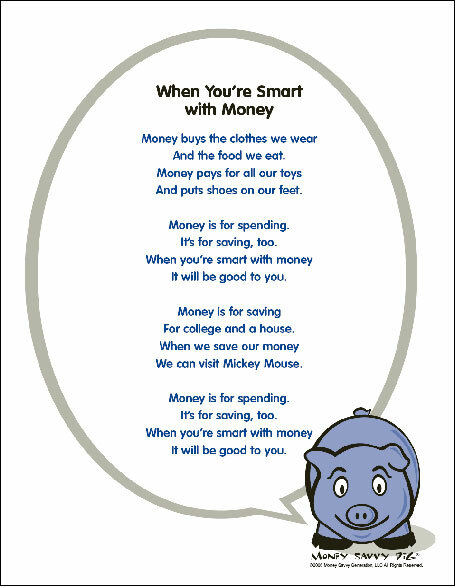 Independent research proves this program's ability to improve children's attitudes and behavior about money management. Have more than one child at home? 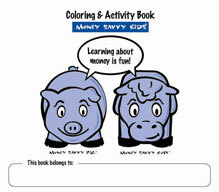 For $24.99 you may purchase additional student materials consisting of a piggy bank, workbook and coloring/activity book. If you already own a Money Savvy Pig/Cow/Football, you may purchase a kit without a bank. Download extra copies of the Allowance Contract here. © 2001-2019 Money Savvy Generation, Inc. All rights reserved.